Miguna is circulating on the Internet and elsewhere a statement dated Saturday, August 25 in which he attempts to spin what’s thus far happening in his book tour which is more of a Raila trashing tour than a book tour. Are you heartbroken because your efforts to bring down Raila have failed as others by others have before or are you heartbroken because the book itself has has flopped and nothing in your so-called book tour is going as planned? These rights are already guaranteed in the constitution and are being enjoyed by all Kenyans without any inhibitions or impediments even by you and the incidences involving or appear to be hooliganism cannot be ruled out not to be stage managed in efforts to sully or otherwise maliciously try to drag and link Raila with the hooliganism he has nothing to do with. Much as your book has flopped, these efforts, too shall fail for Kenyans are smarter and know better. By “Kenyans” I here mean those objective and not prone to fall to antics designed to appeal to divisive tribalistic instincts driven by blind hatred. What evidence do you have that these “marauding and organized gang” is Raila’s or was sent by him? Is this not continued defamation of Raila that, if he were not the statesman he is, he would otherwise take you to court and hold you accountable? Or do you think as there is no doubt you have yourself convinced fully that if it falls from your lips or emanates from your fingers typing into a keypad then it must be unchallengeable truth? News flash: Only Raila haters buy hook, line and sinker what you say. The rest either reject it outright or take it with a grain of salt as they should. In your continued rage and blind pursuit of a goal that clearly you cannot meet, namely, bringing down Raila, you have failed to notice Raila has long since dismissed you as a madman and would have nothing to do or say about you and that includes caring whether your book tour is a success or not. Your desperate effort to link Raila to your troubles is just that: desperate efforts to link Raila to your efforts, which shall fail much as your “volcanic” book has proven to be anything but. In fact, the book has revealed more about you and exposed you for who you are to those who did not know you but not in the manner you anticipated and tells us nothing about anything else with even remote explosiveness as you falsely claimed in hyping its content pre-publication. This comment I find comical but not surprising coming from you because a victim does not condemn what happens to them; others do in their behalf when the victimization is obvious. Again, this is smearing and defamation of Raila for (a) you have not an iota of evidence that Raila has had anything to do with your troubles and (b) Raila himself has dismissed you as a madman better ignored it’s preposterous and very like you to continue insisting you’re that important for Raila or anyone to stoop to the level of sending hooligans to interrupt your peddling of a book that has obviously flopped and will have no impact on Raila or anyone but you for that matter. No one begrudges your speaking out against the Moi regime and paying a price for it, which many others did as well, including Raila himself. Your life was spared and you managed to safely exit the country and remained out of the country and its affairs until returning in 2007 highly anticipating to work for the man you admired, loved and defended until you were unceremoniously shown the door last year. That man remains the same man you admired, loved and defended until you were unceremoniously shown the door last year and this remains true no matter what you now say about him in your desperate and blind effort to exact revenge for what happened to you; even in revenge, there surely must be proportion. You have over-revenged and the whole thing has blown up in your face which you cannot blame anyone but yourself. But that’s not a license to lie, besmirch, smear and defame others at will or without fear of consequences. Again, true but if you are trying to put yourself and your antics as belonging in the same group of heroes, then we kindly urge you not to out of respect for those heroes. You don’t even come remotely close and you know it–well, let me take that back for you may actually believe you do. FYI, nobody thinks or believes that we fought and passed the new constitution to elevate Raila to the presidency. Again, you have no evidence and neither does anyone because its false that Raila has “obviously directed, organized and authorized his hooligans” to subject you to “inhumane treatment; to harass you and to deny” your rights of thought, movement, expression and association. Sorry to burst your bubble but Raila doesn’t think you’re as important as you obviously think you are. In fact, he thinks and has publicly said he believes you’re unhinged and have become a madman he wishes and has, in fact, decided to ignore you much to your chagrin for you clearly and desperately wish he engages or responds to your antics. He won’t beyond what he has. There is no such a thing as “Raila Odinga’s thugs” and this is a lie you’re obviously desperately trying to repeat as many times in the hopes of it being taken as true. It won’t except among those who like you hate or can’t stand Raila where neither truth nor facts matter. I know you dismiss everyone but you to be stupid or otherwise not intelligent but you’ll be surprised when you come back to reality that most people are, in fact, intelligent and not stupid so they know your book is not about these issues you’re claiming to be your concern but the book is nothing but a vengeful effort to get even with Raila for dropping you as one of his aides. He actually thinks and has publicly said you’re a madman. You’re no more threatening to him than a madman in any village. In fact, most madmen are not that threatening at all. There is nothing in your book for Raila to respond to and we know you’ll be thrilled were he even to say anything about you and your book beyond what he has said but he shouldn’t and am sure he won’t. If you think lying about others, issuing empty threats and challenges and defaming people is living according to the dictates of the new Constitution, then this is worse for you than I previously thought. But there is the right and legal way to do this and the wrong-headed and illegal way of doing this. Needless to say we must go with the former but you’ve opted to go the latter way and if we are to go your way, then we might as well do away with the law and strictly engage in judging and evaluating leaders based on lies, innuendo, conjecture and rumors. [/quote]. For the last time, stop this desperate attempt to link Raila with your troubles in your so-called book tour for he has nothing to do with it and it’s condescending albeit not uncharacteristic of you to lecture Raila about respecting the Constitution he so gallantly fought for its passage and double so for telling him he is not above it or the law flowing from it. Others may intimidate and try to muzzle you but leave Raila out of it as he is not interested. He has more important things to do such as making sure he is reelected but this time sworn as president. You’re not anywhere on the list of things he has any concerns about or would spend even a moment to ponder. Raila will ascend to the presidency by winning the hearts of Kenyans again as he did in 2007 and by meeting the constitutional threshold for being sworn as president. And Raila is leading in the efforts to take on the merchants of impunity. I’ll be surprised if you’re not given a red-carpet welcome in Nyeri. You might as well declare your candidacy for Othaya MP while there. I honestly feel that Miguna’s theatrics are a real threat to the peace and the NSIS as well as Mzalendo Kibunjia’s team should and must keep him in check. He is a lose cannon, hitting at imaginary enemies, and in the process sowing seeds of discord in an otherwise peaceful citizenry. These antics and stage-managed “hooliganism by Raila’s thugs” are meant to achieve a particular purpose. That of portraying the PM as one incapable of listening to a dissenting view. Miguna having elevated himself to the true liberator of the people of Kenya from the he only knows what, is in my view a rebel with a cause – a cause to justify his pay to his paymasters. His intentions with the so called book tour go beyond his own desire to settle a score with the PM. Do not be surprised when, in the fullness of time, we realize that Miguna was simply fulfilling a contract. The speed at which a well known blogger from central province and a gun for hire for the PM’s enemies post these “updates” on Facebook under an account called “Miguna At Miguna” shows just how well these so called “attacks by Raila’s goons” are choreographed and meant to elicit a particular response. Now, the real question is “Who is the real goon here”? Is it the few young men, obviously acting on their own as a result of provocation by Miguna, or is it the man conducting un-needed and so far much ignored “book tour” with the purpose of fulfilling a contractual obligation on behalf and at the behest of the PM’s political adversaries? 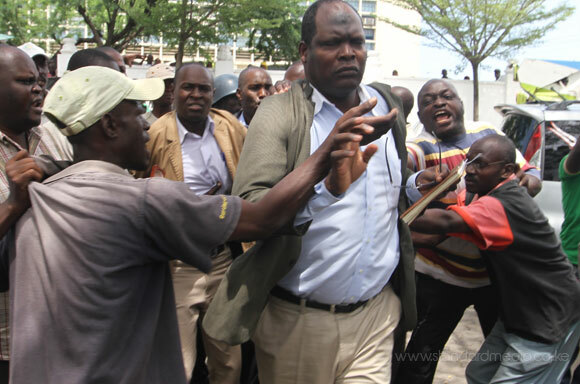 The real goon, the one who is a threat to the peace and a real threat to cohesion, is Miguna Miguna. We are in an election year, and following what happened in 2007, the least we need in an inciter. Miguna has written the book, which is democratic right. Let him now supply it to bookshops and even markets. He needs to give Kenyans time to buy and read it, and respond! Very well stated Oscar; there is nothing to add let those with eyes see and accept the truth as we are stating it.